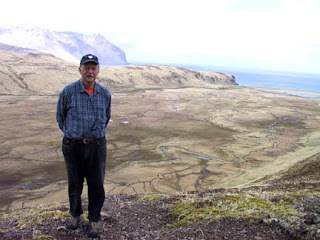 Somewhere on my webpage I put some pictures of what I call hot spring valley in Akutan, an island in the Aleutians. The Aleutians, you will remember are the place where the Baidarka was invented. Anyway, I put up a picture of myself at the crest of the pass overlooking the valley. And, barely visible on the valley floors are some cows. The cows were imported by someone wanting to raise them on the one thing that is plentiful in Akutan, grass. 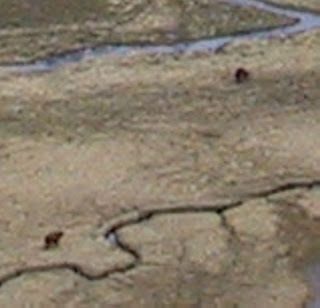 That project was eventually abandoned, but the cows stayed behind and have made the hot springs valley their home. I imagine the hot springs keep the grass accessible in the winter and also offer some refuge from the cold. I don't know if the cows hang out in the hot pools up to their necks like those monkeys in Japan, probably not because they have to eat a good part of the day. Still, here they are surviving. And then yesterday I get an email from a guy named Sam Brown who has just started building skin boats and in the letter, he tells me that it was his family who brought those cows to Akutan. Sam currently lives in Korea and this is where he has been building his skin boats. He also tells me that some of his Korean friends have caught the skinboat bug and want to build some. So there you have it folks. More evidence that the internet brings people together and brings people together with their cows. Any reason that one couldn't make a skin on frame kayak with cowhide? Indians of the Gt. Plains used buffalo for "bullboats," but I don't think these were very durable. People have used cowhide for skin on frame boats. See Tim Severin's book on the Brendan Voyage. The main problem is that cowhide is a little too thick for kayaks and needs to be split. If you buy a raw skin, it won't be split. You would have to split it yourself. Secondly, rawhide has to be kept moist or it will shrink to the point of distorting the frame of the boat. You can't just put a hide on a boat, even one of appropriate thickness and then toss the boat in a garage for a month and expect to come back to a usable boat. Thirdly, in warm climates, wet rawhide rots in a short time as Captain Cook found out when he hauled some baidarkas to Hawaii. On the other hand, you could probably get a split cowhide, already tanned and seal the seams with some modern urethane sealer and have some success with that.